Quiet convenient location on a private orchard, close to ferry and beaches. Stroll to Oneroa village, cafes and fine-dining, cinema, art galleries, walking distance from the ferry and a hop, skip and jump into the ocean. Discover why Conde Nast Traveller recently described Waiheke Island as a paradise of extraordinary wine, sophisticated food and warm, welcoming locals. Stroll to great restaurants and cafes in the village, relax at one of the many beaches on Waiheke and take a vineyard tour - too many to choose from! Walking distance to local vineyards. 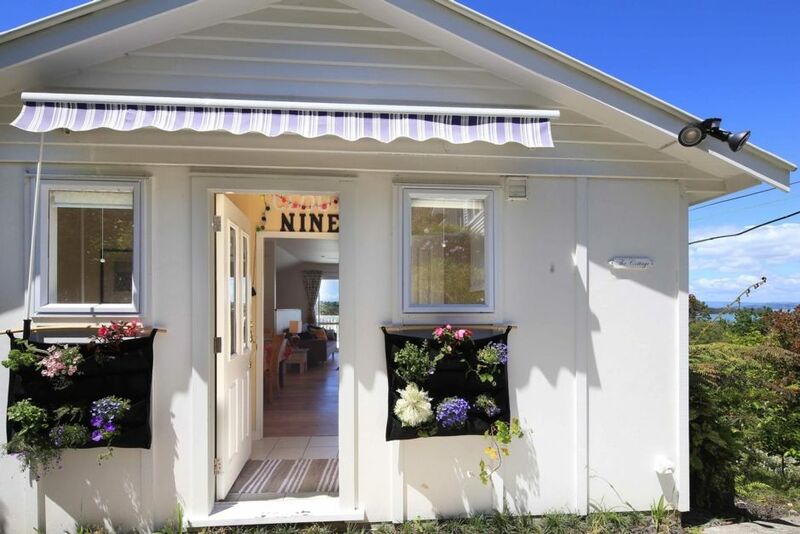 Comfortable and well-appointed Cloud Nine cottage has everything you need. Original art works and books will make you feel at home. Snuggle into brand new beds with luxurious goose-down duvets, pillows and linen from Wallace Cotton. Fully-equipped kitchen gives you self-catering options if you would like to relax at "home". Lovely to host you and glad you enjoyed our beautiful cottage. Position was great for both the beach and the Oneroa shops. Position was great for both the beach and the Oneroa shops....a novelty for us as we usually stay at Palm Beach. All fittings and amenities were excellent and bedlinens and reading lights just perfect....I read a lot at night! You are welcome back any time. Glad you enjoyed your stay in our little piece of paradise. Cosy cottage. Probably better if it had not rained 80% of the time - not the Cottage's fault ! Service was outstanding when I left my phone on "charge" in the cottage and was at the ferry!! This saves the men in white coats having to be called!!!! Gorgeous house, very handy location. Gorgeous house, very handy location. Just a shame that the internet was a bit slow. Very nice Bach, great location and well equipped. Very nice Bach, great location and well equipped. Would definitely stay again and recommend to anyone looking for a relaxing place to stay. Thank you.